Why say something once when you can just as easily get away with saying it twice? Everything Everything release the first cut from their next album as a single this week and they make things rather nice and symmetrical with its title, 'Cough Cough'. This manic and wonderful track highlights all that is unique about the quartet: choppy song structures, hectic vocals and hooksome melodies. Returning to London for a headlining gig next week, the lads are preparing to take 2013 by storm, with early reports of Cough Cough's parent album, Arc, promising a sonic treat for sore ears. Londonist took this opportunity to corner drummer Michael Spearman (he's the forlorn-looking beardy to the left) and pose various ponderments for his consideration and response. Congratulations on 'Cough Cough', which is really quite something. Was it a unanimous decision for it to be the public's first taster from the new album? The four of us in the band were all in agreement that it should be the first song that we return with because it has some elements in common with the sound of our previous album, Man Alive, but we feel it goes further and is bolder. We're very lucky to have a label who listens to us regarding these kinds of decisions. When you guys started writing Arc, what did you envisage it sounding like when finished? We didn't really have too many specific goals when writing the songs; we just carried on writing and made sure that only the best songs made it onto the album. In general, we wanted the songs to be more focused and easier to sing this time round so the melodies are stronger but I think we've still managed to hold on to the essence of what our band is. It's just been boiled down so that it packs more of a punch. Now we expect you to be objective here... hand on heart — how many songs on Arc are at least as amazing as 'My KZ Ur BF'? That's difficult to answer. We're a restless bunch and try not to repeat ourselves but I think there are songs on Arc which fans of 'My Kz' will definitely be into. In general, I think Arc is probably a little darker in tone than Man Alive was. You're showcasing the band's new material on the current tour. Were the new songs arranged with a view to being played live or have you had to adapt their album versions to the live setting? I think naturally any band's songwriting is informed by playing live. We definitely considered how songs would come across live because we did a lot of gigs in support of Man Alive and we know that, hopefully, we'll be doing lots more with this new album so we're conscious that the new songs work in that way. Do you remember the band's first ever gig in London? Yeah, it was at Cargo in 2009 and I remember we were fairly terrified. We're better at dealing with pressure these days, I think, but back then the words 'London gig' meant that people from the industry would be there and would be deciding whether they wanted to put their time and energy into working with us, often free of charge as we were just starting out. So we wanted to prove to them that we were worth it. The band's still based in Manchester. For you, are London audiences different to Mancunian audiences? I don't think there's much difference, really. We have great shows in both cities and feel very lucky to be playing to people who have taken the time to come and see us. We'll never take that for granted. Who in the band gets the most nervous before live shows? We're all quite similar in that respect. None of us get incredibly nervous but it's good to have a few minutes before we go on just to gather ourselves and jump around to Dr Dre. You've played drums on Bat For Lashes' 'Horses of the Sun', 'The Haunted Man' and 'A Wall' from her new album. How did your involvement with this project come about? Yes, that's true — how did you know that?! I think Natasha liked our first album and, of course, David Kosten produced it. He did her first two albums, which we're all fans of, so I guess he suggested asking me and Jeremy [Pritchard, the band's bassist] to try ideas on a few songs. We worked on it on different days but both of us got a lot out of seeing how she writes and her approach in general as a solo artist, which is completely different to being in a band. I have a lot of respect for how clear her vision is and how she pulls a project together to achieve it. The band's been nominated for quite a few awards with Man Alive. How important are such accolades to you all? I guess some artists think very commercially and if they sell a certain amount of units then they have done what they set out to do and can feel they're doing a good job. We don't think in those terms so for us being nominated for the likes of the Mercury Music Prize and the Ivor Novellos is a really welcome and humbling nod that we're doing OK and, of course, we're heartened by that. However, it's dangerous to get carried away or rest on your laurels because you're only ever as good as the last thing you make or the last gig that you play and we always want to be improving. The album's only coming out in January. Now, for argument's sake, if family members and friends ask you for the new Everything Everything album as a Christmas present a couple of weeks early, could you be persuaded to break the release embargo? Our mums will each receive the album on cassette on Christmas Day but they'll only be allowed to play it on their Walkmans and can never speak of it. Fair enough. And, finally, are there any unusual items on your rider this tour? We ask for all sorts but, in reality, we only ever receive ham, hummus and Berocca, which is absolutely fine by us! Cough Cough is out now on Sony. 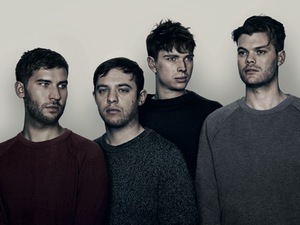 Everything Everything play Village Underground on Tuesday, 23 October. Ticket information is available here. *Londonist does not, in fact, know everything.